Over the weekend, Disney held their Destination D: Celebrating Mickey Mouse party celebrating Mickey’s 90th birthday. As part of that celebration we got several new details on things going on around Disney World. They did cover some Disneyland related items too, but that’s not really our focus so we’ll leave that to others. 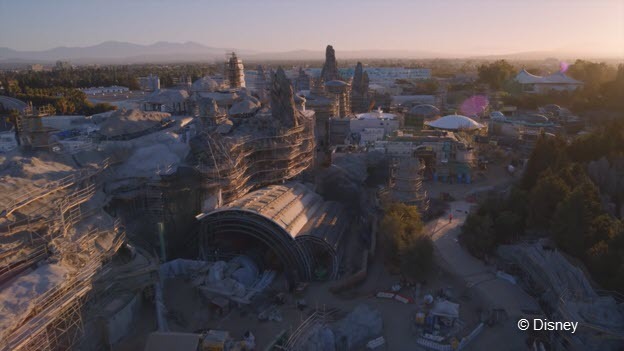 For this blog article, we’ll focus on the new details that they released as it relates to Star Wars: Galaxy’s Edge. We’ll cover the non-Star Wars related news for Disney World in a separate blog post. 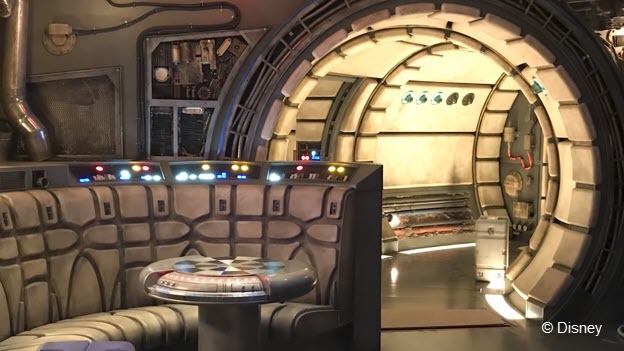 It has been previously announced that there was going to be some sort of Millennium Falcon based attraction within Galaxy’s Edge. We now we have a name and a quick little video teasing it. So, I guess what we can surmise is that you’re a smuggler, trying to get some important cargo to someone willing to pay a high price. To quote Han and just about ever other Star Wars character, “I’ve got a bad feeling about this.” No, not the ride, but rather the twists and turns it will have. I’m sure there will be encounters with the Empire (or maybe the First Order, depending on when this is set). We also wouldn’t be surprised to hear of encounters with Boba Fett, given his history with Han and the Falcon, if it’s set during the Empire Era. The really cool part we’ve read about is that this attraction will present a unique experience to each crew, based upon their own decisions while in the cockpit. How is that possible? We’ll according to this NY Times article (credit to Disney Tourist Blog for finding this), Disney will use real time rendering technology developed by Industrial Light and Magic for their special effects in movies. You’ll control the Falcon with what appears like the same cockpit setup in the movies. Your decisions and actions. Your outcome. We’re quite excited to see how Disney will pull this off and how great the experience is. We’ve dreamed of piloting the Millennium Falcon much of our lives. Now we all get our chance! You can see the little teaser video they put online below. The second attraction we got a name for is Star Wars: Rise of the Resistance. We’ve heard it will be something based upon (or in) a Star Destroyer and be an epic space battle. Based upon the teaser video and what we’ve read, you’re going to get to experience this space battle from the perspective of the First Order. In their own D23.com article, Disney even teases a face to face encounter with Kylo Ren. Not sure how they will pull this attraction off, but some of the leaks out there suggest this attraction could be epic. 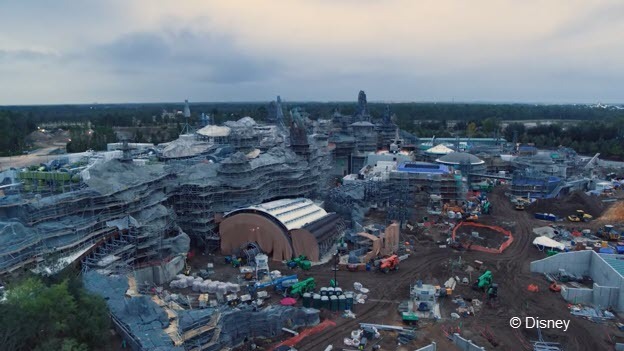 The fanboys (and girls) in us are really excited for the Millennium Falcon attraction, however, we think Rise of the Resistance could be a game changing experience for theme parks. And that’s whether you’re a Star Wars fan or not. The amount of time you spend waiting in line could be game changing too. Just in a not so good way. 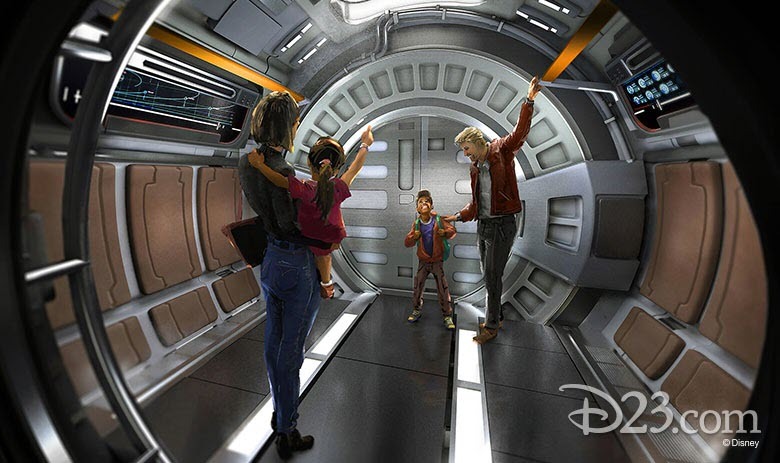 It may make the Flight of Passage wait times look like childs play. If you go to Disney World, you know that the music within the various lands of all the parks adds a unique ambiance to your time there. Carla (and many of you) will sit and just play the Disney World park soundtrack music as a way to be transported there. When thinking of music and Star Wars, there is one name where the conversation starts and ends. That name is of Academy Award Winning composer John Williams. Williams is known, for his great catalog of film scores, but Star Wars may be his best or at least most known. But hey, if you like Jaws, Jurassic Park, Indiana Jones or one of his other countless films scores more, we won’t argue with you. Well, Disney is bringing out the big gun one more time, announcing that Williams will compose an all new unique score for Galaxy’s Edge. You can hear some of it in the video below that they released. Even if the music doesn’t interest you, the video is worth a look because it features some up close images of the park, inside and out. Take this as a sign of how serious Disney is about making this park “right”. They aren’t messing around and that should pay dividends when we get to hit the park. Several of the images here are screen caps from the video, if that gives you an idea. As for the music itself, it strikes us as great Star Wars music. Unique from the traditional score that everyone knows, but it still carries the tones that Star Wars fans will know an recognize. This may be one of the things we are looking forward to the most. We may have to go find a speaker in the park where we can just sit down and listen for a while. Disney did make mention that they are hard at work on a new level of integration with the Play Disney Parks app. What this integration will ultimately look like, we’re not sure. 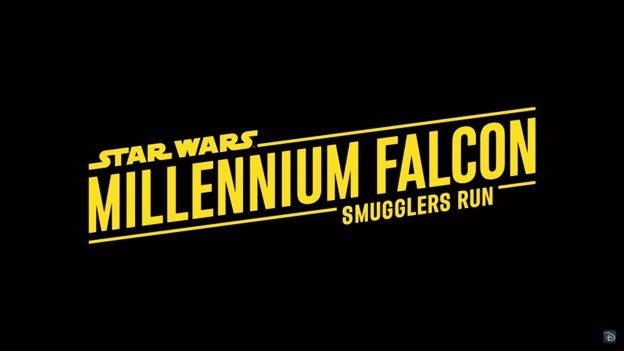 There were some references to it as it relates to Smugglers Run, so it sounds like you could have some interaction in the attraction. We’re assuming it’s not while actually piloting the Falcon, rather something before the ride in the queue or after the ride. Either way, we think it continues to show Disney’s focus on using their apps and technology as a way to up the experience level of your time in the parks. Being able to include the technology from the very beginning gives Disney a way to integrate it unlike other parts of Disney World, where they have to work it in after the fact. 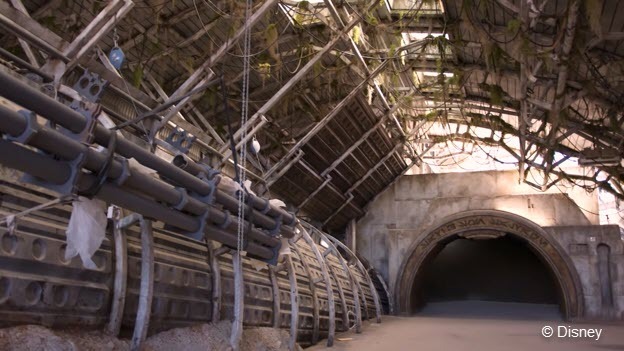 We’ll see what it ultimately looks like, but we’re hopeful that this makes Galaxy’s Edge that much more unique. Time will tell. In addition to the in-park items above, Disney also provided a little update on the Star Wars hotel that is currently under construction adjacent to Hollywood Studios. Unfortunately, we didn’t find any videos associated with on Disney Parks Blog YouTube channel, so all we have it Disney’s D23.com article to go off of. We’ve also read some other updates that say the hotel’s windows will actually be TVs. These TVs will show you a space scene as you continue your cruise aboard your luxury starship. We’re assuming there will be some way to see the outside world, as that may be a bit weird, but who knows. Disney has been clear they are going for a truly immersive experience, that will be unlike anything you can go to another theme park and experience. Not having windows would certainly fit that bill. And there you have it, a pretty busy news slate on Star Wars: Galaxy’s Edge over the weekend. We’ll see what else comes out over the coming months and update you as we hear more. If you found this Galaxy’s Edge update useful, fun, or at least entertaining, please help us out and share it on social media. It helps us spread the word on our blog and hopefully entertain and educate more people on all that’s happening at Disney World. We’re always truly grateful when you feel that our content is good enough to share.